I want my photographs to tell a story, and I am really excited by the story of this photograph of a North American LT-6 Texan. This aircraft was photographed during my recent visit to the Dixie Wing of the Commemorative Air Force in Peachtree City, Georgia. The Dixie Wing volunteers had been generous enough to pull out several of their World War II aircraft and line them up on the taxiway, despite heavy rains that day. This aircraft had just barely been pulled out of the hangar, which presented an interesting opportunity.... could I take a photograph in broad daylight (ok, overcast rainy daylight) that made it appear that this aircraft had just pulled out of the hangar and was preparing for its next sortie. Unfortunately, the hangar behind this aircraft was very cluttered and it was going to be hard to present this hangar in such a way that a viewer would believe this photograph was from World War II. 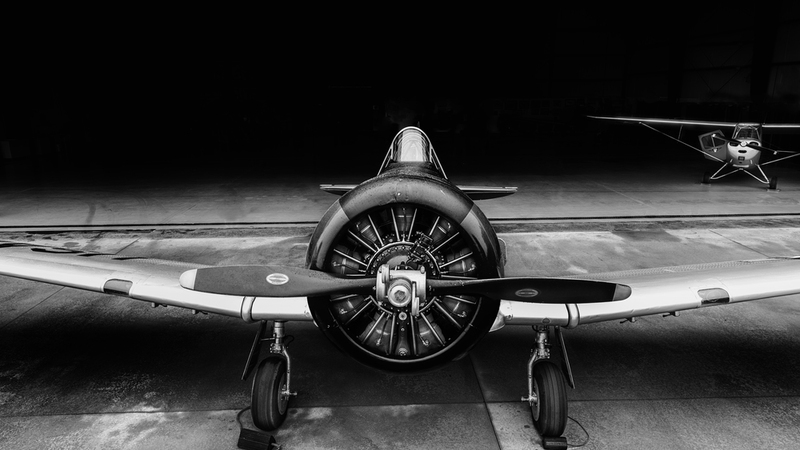 The only thing playing to my storytelling was an L-16 that was used during World War II in the background; by levering that aircraft, I could create the appearance that the LT-6 Texan had just emerged out of the dark hangar it shared with another aircraft. To get this photograph, I climbed about 5ft up a ladder to shoot down on the airplane from a higher vantage point. The higher vantage point also meant that it would be easier to trick the camera into making the hangar darker. The biggest trick was to make sure I was centered on the aircraft and holding the camera level! After the shoot, I converted the photograph to black and white and was able to achieve the look I desired. Now when I look at this photograph, I see a warbird getting ready for its next battle, and I hope you see that too! Emerging Texan: A US LT-6 Texan aircraft with an L-16 in the background. This photograph makes me think the Texan is emerging from the hangar to get ready for its next mission during World War II.